Since the release of the Corporeal Beast there have been hundreds of thousands of the boss killed. It is fair to say that the boss has become a favourite of many and the hunt for sigils is one that many players have taken on wholeheartedly. In order to help players along with this hunt and due to popular demand, we would like to offer the ability to create an instanced version of the boss for yourself and your team. To open up an instance you would need to have placed at least 200,000 coins in a coffer that will be found in the cave of the Corporeal Beast. Once opened, 200,000 coins would be removed from the coffer and you would now be allowed access (along with players in your friends chat). The instancing system will allow you and your team to consistently kill the Corporeal Beast in peace without having to worry about being crashed. 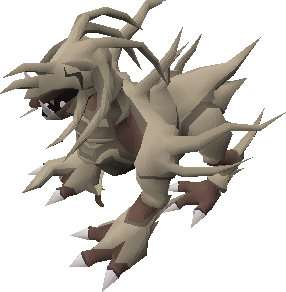 Question: Should we add an instanced Corporeal Beast that allows players to take their clan chat in? It would cost 200k per entry for a team of any size. When using an elysian spirit shield, despite the incredible strength of the special effect, there is no way of telling when the shield is working away and reducing incoming damage. In order to give you a better idea of just how much the shield is doing we are going to be offering a small animation that would play to indicate when the effect of the shield activates. The animation would be subtle to make sure that you are still able to see exactly what is happening when you're in combat but it would still be apparent just how much your shield is helping you. Question: Should a subtle animation play to indicate when the Elysian spirit shield effect is activated? Before Mod Alfred left the Old School team, he had a go at re-working the appearance of both the Armadyl crossbow and the Armadyl crossbow special attack. Right now the Armadyl crossbow is simply a slightly modified Hunters' crossbow, many players have asked for something a little more. Below is the model that Alfred created for the crossbow. Question: Should the Armadyl crossbow and its special attack be graphically re-worked? The Nightmare Zone arena is not the most unique of areas as it stands. Mod Ghost would like to offer a graphical re-work for the arena to make it a little more interesting and to make your hours and hours spent in the arena a touch more enjoyable. At the moment he has not started working on the re-work. Offering this in the poll will allow us to judge if this change is something the community would be interested in seeing. Of course, as Mod Ghost works away on the new environment he would be constantly sharing his progress with you all and, of course, listening to feedback. Question: Should the Nightmare Zone environment be graphically reworked? Question: Should a back door be added to Lumbridge Castle to give access to its courtyard's back gate? Question: Should the click-zone of wyverns be increased to make them easier to click? Question: Should an 'Empty' option be added to the coal and gem bags when the bank interface is open? This would allow you to empty them directly into your bank. Question: Should the right-click 'Check' slayer gem and slayer ring be made usable when the bank is open? Question: Should the colours of all imbued rings be tweaked slightly to be made more distinguishable from standard rings? Question: Should you be able to queue up a plank make spell, like you can with alchemy and superheat spells? Question: Should packs of 100x eye of newt be added to the stock of shops that currently sell eye of newt? Question: Should the Priest in Peril requirement on being assigned bloodveld, nechyrael, aberrant spectre & abyssal demons be removed? The 4 monsters are now available in the stronghold slayer cave. Question: Should a right-click 'change gauntlets' option be added to the family crest brothers? Question: Should we remove the dialogue at the entrance to King Lathas' training ground to make entry less click-intensive? Question: Should the games necklace have an option to teleport to Tears of Guthix, requiring the quest to be complete? Question: Should Hans be able to tell you your Old School time played on your account? Question: Should the ironman chat icon to be visible in chat? Question: Should the default stock of Recipe for Disaster items be increased from 5 to 10 if you have completed Recipe for Disaster? This would not affect the food chest. Question: Should the Zamorakian spear attack animation be reworked to use both hands? Question: Should ironman accounts be permitted to buy scrolls of redirection from Nightmare Zone? Question: Should boss kill counters be removed from the game filter?